Please note: this item is a non-stocking item and will have a 12-14 week lead time. Please keep this in mind when ordering. The BARBADOS Collection is a classic style that will look beautiful with your hotel or resort's outdoor seating and dining area. Each piece is made from fully welded aluminum framing and then wrapped in Kannoa's all-weather wicker for a durable finish that will last you years. This collection is also popular with condos and apartment complexes. 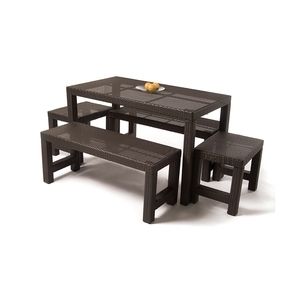 Kannoa offers outdoor furniture specifically designed for weather resistancy and extreme durability. Our selected products have modern lines with a clean look for any patio, lawn or deck area and the convenience of all-weather wicker and powder coated aluminum frame. All Kannoa products stand for Design, Functionality, Durability & Harmony. Dimensions: W 50 in. D 28 in. H 30 in. 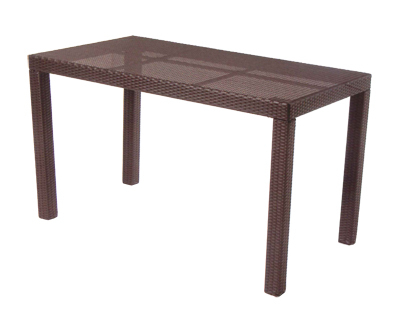 BAR303 Barbados Dining Table W: 50" D: 28" H: 30"
BAR401 Barbados Stool W: 22" D: 16" H: 16"
BAR402 Barbados Bench W: 44" D: 16" H: 16"